Home / Enter to Win the BC Magazine Hairspray Giveaway! When big hair meets big dreams, anything can happen! Enter to win! Enter to Win the BC Magazine Hairspray Giveaway! When big hair meets big dreams, anything can happen! The beat goes on this holiday season! Grab your dancing shoes as Hairspray, one of the most well-reviewed movies of the year, arrives in stores November 20. The film is based on John Waters’ contemporary classic film and the subsequent Broadway musical about star-struck teenagers on a local Baltimore dance show. The all-star cast includes John Travolta, Michelle Pfeiffer, Christopher Walken, Amanda Bynes, James Marsden, and Queen Latifah. You can take a look at the trailer and a lot of other goodies at the official Hairspray website. You can read what Chris Beaumont had to say about the film, which he calls "quite infectious", and Daniel J. Stasiewski proclaims that the soundtrack is "defiantly great." Because BC Magazine loves movies, and because we love our readers, we're very happy to be giving away five (5) prize packs consisting a copy of the single-disc DVD and the official soundtrack! So not only do you get to enjoy the movie whenever you want, you get to take the music with you, too! THIS CONTEST IS NOW CLOSED. THANKS TO ALL WHO ENTERED! All entries must be received by December 14, 2007. Five lucky winners will be drawn after December 15, 2007. 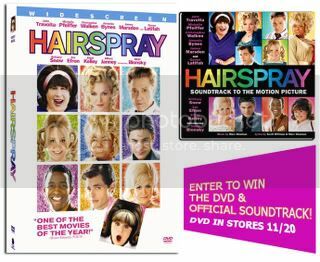 Winners will receive a copy of the single-disk DVD of Hairspray and a copy of the official soundtrack album. Winners will be notified by email and in the comments section below.